Manset Rock - Family Friendly Retreat. 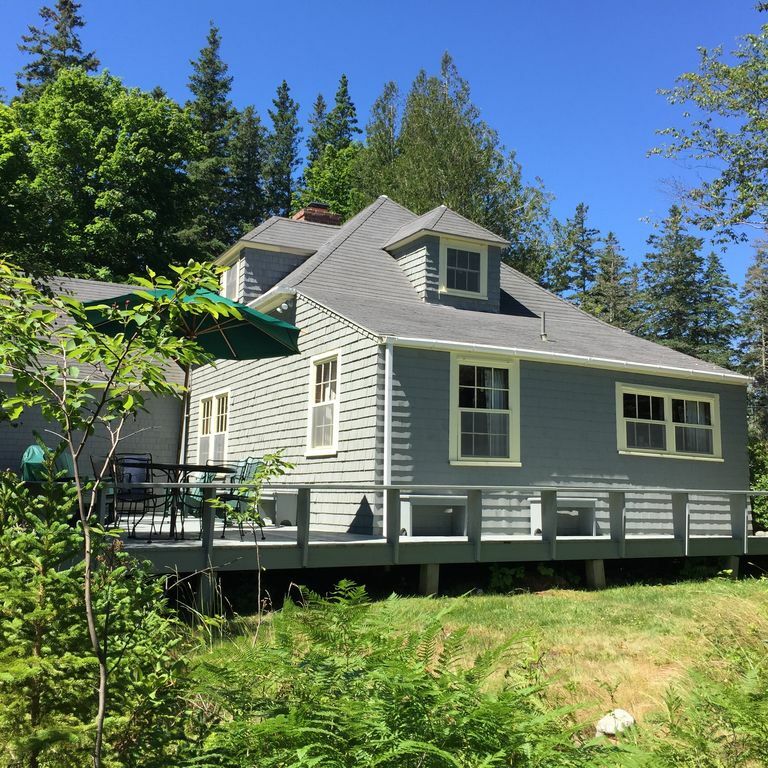 This 3.5-acre property is located on the Quietside of Mount Desert Island (MDI), home to Acadia National Park (ANP). Manset Rock: The property includes two homes (The Main House and The Cottage), a boat house, private dock and woodland trail. It overlooks beautiful Southwest Harbor, the entrance to Somes Sound, inner and outer harbor islands, as well as the western and eastern mountains of Acadia National Park. Perfectly located for sunrise or sunset views, or for simply relaxing and watching the elegant Hinckley Yachts, sailboat races or local fishing fleet come and go. A few steps out the door and you can catch the Cranberry Cove Ferry to the outer islands or the Island Explorer - Acadia's free shuttle that offers Mount Desert Island visitors and residents free transportation to hiking trails, carriage roads, island beaches, and in-town shops and restaurants. Original to the property, The Cottage was transformed into a charming guest house in the 1960's. It is a one-story wood-shingled home with private sleeping loft. The home provides ample space for gathering - or seeking solitude - with large bedrooms, central living room with fireplace and game table, cable TV and Wi-Fi, with plenty of books, games and puzzles to keep you busy when inside. The Cottage includes an extra-large back deck with woodland and ocean views. There is also a seasonal wildflower garden, wild blueberry patch and you can access the private pebble beach via a short walk along the Deer path nature trail. The Cottage has 4 bedrooms that sleep 7, a large great room combines living/dining rooms, and a full kitchen with breakfast nook. It comes complete with an outdoor gas grill and outdoor furniture. Appliances include a HDTV, wireless router, washer, dryer, dishwasher, electric range, refrigerator, microwave and hair drier. Great for a small group of friends or family, or the Cottage can be rented along with the Manset Rock main house to accommodate larger parties. No reason to even leave the property, with so much to do right here! Enjoy spectacular views from nearly every room, or explore the ever-changing tidal pools or beach comb along the large cobblestone beach. There is even a private nature trail that winds throughout the property. Nature comes to you in this wonderful spot, with sightings of deer, fox and raccoon, as well as otter, seal, dolphin, osprey and even an occasional bald eagle. You are minutes away from even more fantastic outdoor actives with Acadia surrounding the property. The Quietside of MDI is home to Acadia's Seawall Entrance (with ranger talks), Ship Harbor Nature Trail, Bass Harbor Light, Echo Lake Beach, and some of the most scenic hikes in the park, including summit trails up Acadia, St Sauveur, Mansell, Beach Cliff, Flying Mountain and more. Cranberry Cove Ferry and Island Explorer – Acadia’s free shuttle – stop just a few doors down from the property. If you are game to venture further afield, we recommend you take in a sunrise on top of Cadillac Mountain, learn about the park at the Acadia Visitor Center and Nature Center at Sieur de Monts Spring, follow the Park Loop Road and stop by observation spots at Sand Beach, Thunder Hole and Otter Cliff. For the more adventurous, try biking the Eagle Lake carriage path, hiking the Precipice Trail on Champlain Mountain, cooling off at the ledges at Echo Lake, exploring Long Pond by canoe or Somes Sound by kayak, try out the links at the Causeway Club or Kebo Valley, and then there is always time for shopping and dining in any of the Island towns, including nearby Southwest Harbor, Northeast Harbor and Bar Harbor. We just want you to enjoy this beautiful part of the Maine coast as much as we do, and encourage you to explore the island! Need additional space? Consider booking the Manset main house, #256323, as well. The main house built in 1903 is a classic oceanfront wood shingled 'cottage,' with 3600 sq ft of living space, and ocean views from nearly every window. Enjoy the outdoors on the 1200 sq ft wrap around porch overlooking the secluded pebble beach. The 3-story home has 6 bedrooms that sleep up to 11, a large living room with panoramic ocean view, a formal dining room with seating up to 14, eat-in kitchen and walk-in pantry. The home provides ample space for gathering - or seeking solitude - with fine crafted woodwork throughout, comfy window seats, wood burning fireplaces, piano, game table and books, games and puzzles galore. The kitchen, dining room and pantry are spacious and accommodating for groups of any size. Electronics include cable / high-speed wireless internet, HD TV, Roku, DVD player, computer, printer, answering machine, fax machine, hair driers, dishwasher, electric range, freezer, microwave, two refrigerators, washer and dryer. Outdoor amenities include a gas grill, private dock, hammock and outdoor furniture. The cottage sits on a beautiful wooded property with a broad private rocky beach. The cottage itself is cozy, clean and has all of the needed amenities. It's not fancy or modern, but is somewhat refreshing in that you feel like you've rolled back to simpler times. We enjoyed fires in the fireplace each evening, playing cards and doing puzzles. We walked through the woods, sat on the beach, read a book on the dock and laid in the hammock. It was a great escape. If you are looking for a new cottage or recently updated cottage, this is not it. With that said this older cottage was clean and comfortable. It is private and quiet. The kitchen was well appointed. There are 3 rooms that have a water view. The water front is just a short walk by way of a wooded path. I took a harbor tour that went right by Bear Island Lighthouse. It was not until later I realized we actually had a view of the lighthouse from the property. The lighthouse is not very tall since it is on a cliff so it does not standout. We stayed 4 nights and had a fire in the fireplace 3 nights. Dry wood was provided. A nice cottage by the woods and water. we thoroughly enjoyed our visit. Cottage was ideally located and we were able to explore the lovely and charming Maine coast. Perfect vintage style cottage. Rustic and gorgeous setting. Ideal for exploring the island. Close to downtown and other harbors. Close to the forest and hiking. Plenty of space - though attic loft sleeping area was too warm to utilize. Every amenity you need and was clean. Definitely reminiscent of another era in a good way! Working fireplace, comfortable beds and laundry area with large back porch as well. The walk down to the beach area is very pretty and we saw many deer. Home surrounded by fragrant lilacs and other flowers. It was a very relaxing and enjoyable stay! Would highly recommend and return. I only have good things to say about this property. BEAUTIFUL location and quaint, cozy interior. Comfy beds and incredible, large deck to eat and relax on. Can see the ocean from the deck. Spent lots of time on the beach looking for sea glass and went hiking in Acadia (less than 15 min to many trails including Acadia Mountain <moderate to strenuous at times> which I recommend - phenomenal view). The cottage is around the corner from downtown Southwest Harbor which is fun for an afternoon of coffee and shopping. 20 min from Bar Harbor. Perfect getaway - I can't wait to go back next summer with friends! Golf: There are two golf courses on Mt. Desert Island. The first is the Causeway Club, a semi-private (open to public as well as members) 9 hole course (that plays 18) in Southwest Harbor, approximately 10 minutes from Manset Rock. The second is Kebo Valley, a very challenging 18 hole course in Bar Harbor, approximately 35 minutes from Manset Rock. No smoking. Pets approved on a case by case basis. Request washing machine be started with towels prior to departure. Remove sheets and leave in pile on bed. Pls empty fridge and take out trash prior to departure.